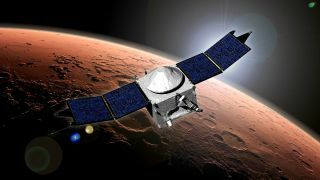 Artist’s illustration of NASA's MAVEN spacecraft, which is investigating how, why and when Mars lost most of its atmosphere. NASA will reveal new results about the atmosphere of Mars this Thursday (Nov. 5), and you can watch the action live. The space agency is hosting a news conference on Thursday at 2 p.m. EST (1900 GMT) to "announce new findings on [the] fate of Mars' atmosphere," according to a NASA media advisory. You can watch the news conference live here at Space.com, courtesy of NASA TV. "Scientists will use MAVEN data to determine the role that loss of volatiles from the Mars atmosphere to space has played through time, giving insight into the history of Mars' atmosphere and climate, liquid water, and planetary habitability," NASA officials wrote on MAVEN's mission page. MAVEN launched in November 2013, arrived in orbit around the Red Planet in September 2014 and began its science mission two months later.